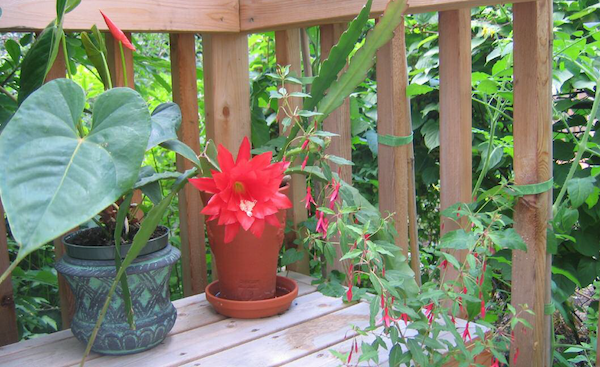 Anthurium, orchid cactus and fuchsia grouped on a corner of the deck. Whether you have a large suburban yard or a tiny condo balcony, houseplants are a great addition to your summer garden. Houseplants add a tropical feel and give your garden a mature, lush look even early in the season. Outdoors in a beautiful glazed ceramic container or a simple terra cotta pot, a well-grown single houseplant makes a bold statement. What exactly is a houseplant? Simply defined, it is a plant intended to be grown indoors. Many are familiar with flowering tropical shrubs and tender perennials, such as hibiscus and begonia, or the lesser- known clivia and abutilon. 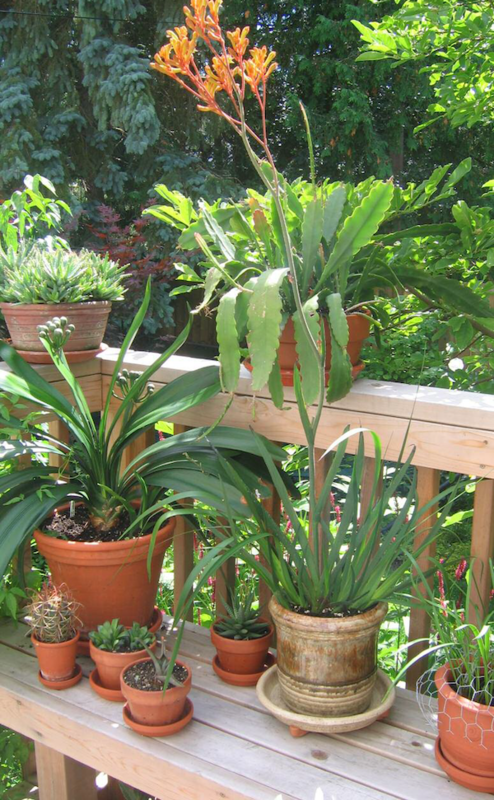 Some have foliage houseplants, such as a fern, sansevieria (mother-in- law’s tongue) or aloe. And while many are aware of these well-known houseplants, few realize indoor plants grow well outdoors in the summer in the right conditions. Some houseplants bring surprises when placed outdoors. Rain and sunshine can sometimes trigger flowering in plants that have never flowered. For instance, plants such as cacti, succulents (especially aloe) and clivia, bloom beautifully outdoors. There are plenty of ways to incorporate houseplants outdoors. Use a specimen plant – a large single plant – as a focal point near an entryway or at the edge of a patio or deck.A large palm will look striking in a beautiful container. Houseplant growth can be restrained by keeping plants in relatively small pots and not re-potting too often. However, what started life as a small windowsill houseplant can get quite large after five or six years, so you are limited by size with some houseplants as they eventually become too heavy to bring in and out each year. Houseplants look great in groupings on a patio table or stand. Five or six cacti or succulents (such as aloe or echeveria) of different sizes and shapes in colourful pots provide interest. Putting houseplants with similar watering needs together also makes sense. When using the “drop-in” technique, houseplants in attractive containers can be placed on the ground in their pots in open gaps in the perennial garden to make it look lush.This layout will also create interest with height and colour. While annuals provide ongoing colour in the outdoor garden because they flower for most of the season, some flowering houseplants also have this role.Anthuriums (flamingo flowers) have vivid red or pink flowers (although the colourful part is not technically the flower). These plants will light up the garden and bloom beautiful heart-shaped leaves. Large flowering houseplant shrubs, such as oleander or hibiscus, are often available in spring nurseries as large “annuals.” They can be brought inside for the winter and kept for several years. Oleander will retain its leaves indoors while hibiscus will shed some, but continue to grow. Some houseplants that are just plain boring indoors (sansevieria falls in this category) can look stunning outside due to their architectural quality.A large sansevieria can be purchased at low cost and placed in a decorative pot. The simplicity of the tall, straight succulent leaves contrasted with the pot gives a contemporary, clean look. Purchase houseplants in early summer in home stores, supermarkets and outdoor nurseries. Kangaroo paw (anigozanthos) in flower with clivia, cactus and succulents.clean look. Outdoor potted houseplants require the same attention as annuals in pots with regular watering, sometimes daily in hot weather, as well as fertilizing. Depending on the plant, a general-purpose houseplant fertilizer will work, or one specific to cacti and succulents. Wait until plants have adjusted to the outdoors before fertilizing full strength — usually in late May or early June. Even after they have acclimatized to outdoor conditions, not all houseplants do well in full sun. A part-sun or part-shade location is often best, especially for foliage plants.Flowering houseplant shrubs do need full sun to produce flowers. Houseplants require special care upon returning indoors. Do not wait until the first fall frost warning.They must acclimatize to the indoors early, ideally before you turn on the furnace. Claire McCaughey practises Ikebana (Japanese floral design). 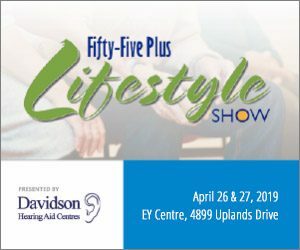 She has a certificate in Sustainable Urban Horticulture from the University of Guelph and volunteers with the Master Gardeners of Ottawa-Carleton. How often should you consider checking wooden fence health?